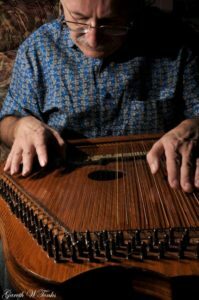 The music played by Quince is an eclectic mix of Celtic, traditional and modern arranged for harp guitar and electric chord zither; also a tenor banjo and guitar which he uses mostly for backing Irish music as in Murphy’s Law. The musicians he admires vary from harp guitarist, John Doan to Andrew Cronshaw, chord zither player; these together with the music of German and Austrian zither players. He admires singers such as Cara Dillon, bands such as Solas, Bothy Band and orchestral music by Vaughan Williams and Gerald Finzi. A photographer and keen cyclist, Quince was pleased to be asked to perform at the Caerleon Festival again this year.